Mr Lee and his wife used to sell raw chickens, but the ongoing avian flu crisis caused them to switch profession. A customer suggested selling wanton noodles. What is the secret to the iight, refreshing tasty noodles? I dip them into stock after they’ve been cooked– that’s the only base I use for my noodles. 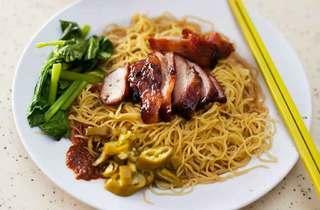 I’m one of the few left in Singapore who makes ‘stock wanton mee’. So the noodles soak up the stock? Yes. Make sure you wait for three to four minutes before you start eating – that’s when the noodles have soaked up enough essence. Just enough time for me to walk to my table and order a quick drink. What about your famous roast char siu? We make ‘premium’ char siu. It’s a high grade of roast pork. 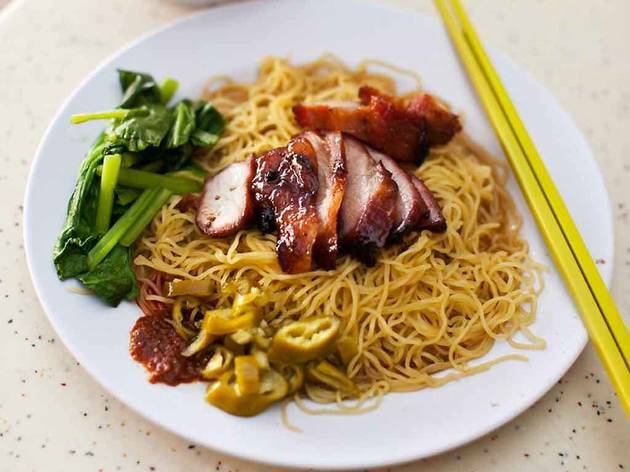 It is from an old recipe which has now become a rarity in Singapore char siu hawker circles. I doubt you can find it anywhere else.